If you say the word "turkey" to anyone, the first word that comes to mind is probably Thanksgiving - but you can cook with turkey the other 11 months of the year too! I'm not talking about buying a 15 lb. turkey here. I want you to go out and buy a package of turkey tenderloins because that's exactly what they are - really tender! They can be more forgiving and flavorful than chicken breasts, and it's a nice change if you're a household that eats a lot of chicken. I made this dish last May and I'm not exactly sure why I waited 8 months to make it again! I think I enjoy trying new recipes too much - so I forget about these recipes I try out and really like. Plus - this recipe is pretty healthy and easy - only took me about 45 minutes to make, from start to finish, and doesn't make a huge mess in your kitchen. I love trying new, exotic recipes - and this one definitely counts. When asked what we were having for dinner, my answer - "African Stew." Despite the concerned looks I got, I went for it and in the end, everyone loved it. I am so appreciative that I have open-minded foodies in my life to cook for! For a while now I've been totally in love with eating Asian cuisine - though cooking it is a completely different story. I can never seem to get the right spices and flavor to the dishes I've tried, but one recipe I've gotten down is the fresh summer rolls you often find at Thai and Vietnamese restaurants. 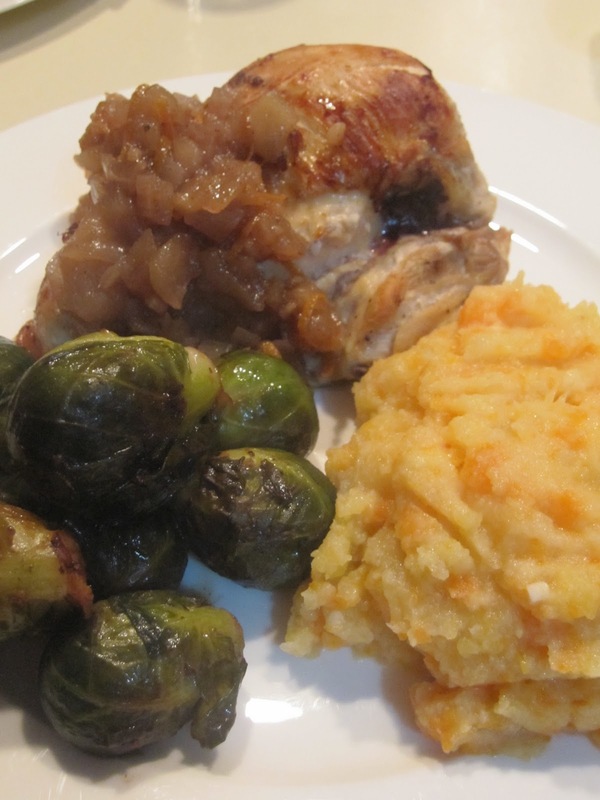 Sunday: Roasted Chicken with Apple Chutney, Mashed Root Vegetables and Sauteed Brussel Sprouts with Baked Apples for dessert! Cooking is all about innovation and creativity. With the oven broke I decided to sear the chicken (bone-in chicken breasts) first in a hot pan on the stove, and finished under the broiler - making sure not to keep the pan too close to the top. The Mashed Root Vegetables drove this menu. I bought a Rutabaga at the farmer's market and had never cooked with it before - so I went in search of a recipe to use it. My dad recently bought a vegan cookbook (The Vegan Table) thinking it was a vegetarian one - but as it turns out the book is full of these great, healthy recipes. This is where the recipe came from - except I substituted all of the animal products I wanted for their ingredients - no butter substitute for me, thank you! ... there was a baby girl born who was always getting into things in the kitchen. 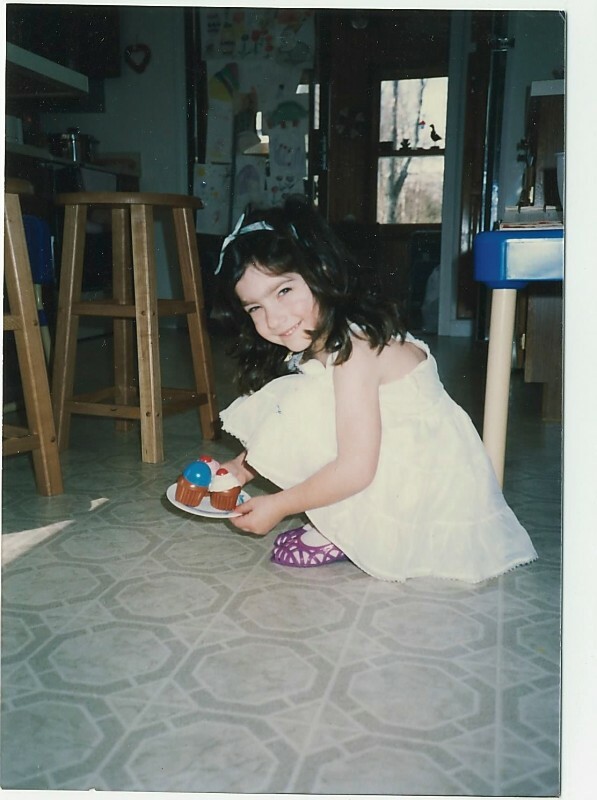 Her mother tells a well-known story of this girl putting her plastic chicken in the microwave to cook, making a mess of flour everywhere in the kitchen and secretly trying to bake her birthday cupcakes for school behind the living room chair. 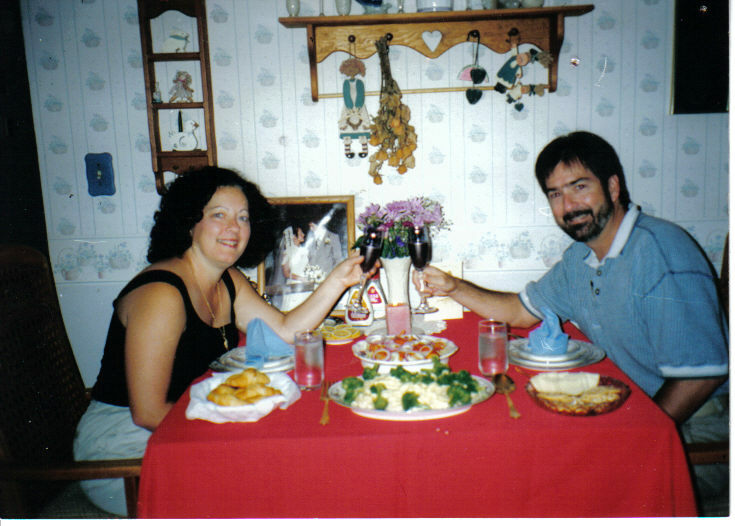 After watching her mom for many years she started cooking on her own - for her parent's anniversary dinner and even creating menus for mother's day breakfast in bed. All of these things should've been a sign - but instead the girl chose to go to business school and then graduate school for a masters in education. As I'm sure you've guessed by now, this girl is me. My name is Elise and it was exactly 7 months ago that I created a photo album on facebook of all of my cooking creations. Friends and family started commenting on the photos, asking for recipes, asking me to cook at their houses - so this new blog is just a more organized, and natural, extension of that food album! I hope that everyone enjoys following my time as ... The Academic Chef! 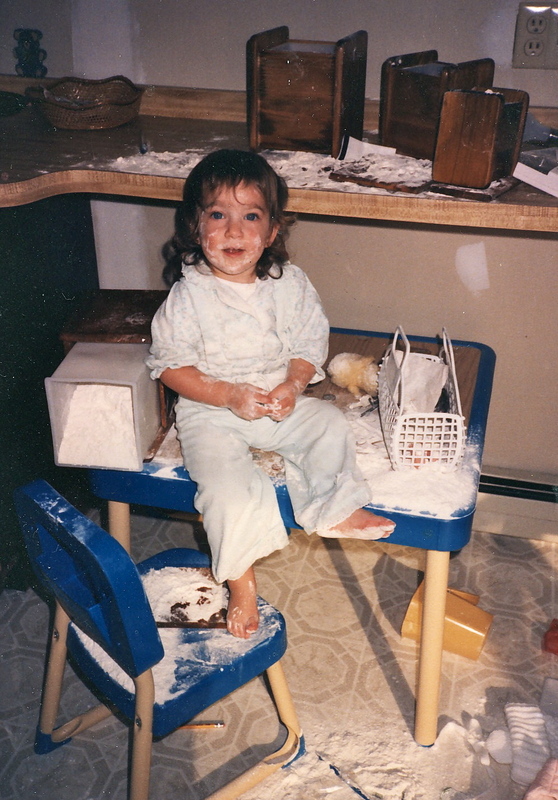 in the flour - surely I just wanted to bake! sure my brother knew how to cook!